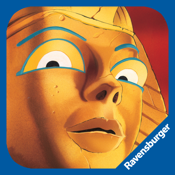 The rich - alas forgetful - pharaoh has taken his treasures from around the world and hidden them in his pyramids to prevent thieves from stealing them. Travel back to ancient Egypt and help him remember where he has hidden his treasures in this memory and sliding tile puzzle game. Compete to find as many treasure cards as possible! ► No set up of the game required! Press “Play” and get started. And best of all, no tidying up after a match!